Professor Mark W.J. 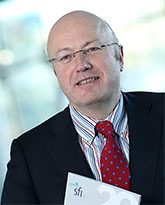 Ferguson commenced as director general of Science Foundation Ireland in January 2012 and as chief scientific adviser to the Government of Ireland in October 2012. Previously he was a professor in Life Sciences at the University of Manchester (since 1984) and co-founder, CEO, and chairman of Renovo Group plc (1998-2011). Mark is the recipient of numerous international research awards, including the 2002 European Science Prize (jointly); the author of 327 research papers and book chapters and 60 patent families; and the author / editor of eight books. Mark graduated from the Queens University of Belfast with degrees in Dentistry (BDS 1st class honours), Anatomy and Embryology (BSc 1st class honours, PhD), and Medical Sciences (DMedSc). He also holds Fellowships from the Royal Colleges of Surgeons in Ireland (FFD) and Edinburgh (FDS) and is a Founding Fellow of the UK Academy of Medical Sciences (FMedSci). He is a member or Fellow of a number of learned societies, and was made a "Commander of the British Empire" (CBE) by the Queen in 1999 for services to Health and Life Sciences.